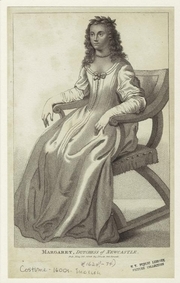 Margaret Cavendish, née Lucas, was born in Colchester, Essex. She went to the court of King Charles I at Oxford in 1640 as a maid-of-honor to Queen Henrietta Maria. In 1645, she married the courtier and author William Cavendish, future 1st Duke of Newcastle-upon-Tyne. Between 1654 and 1668, she published more than 14 books; they appeared under her own name at a time when most female writers could only publish anonymously. She died suddenly in 1673 at age 50. Margaret Cavendish is currently considered a "single author." If one or more works are by a distinct, homonymous authors, go ahead and split the author. Margaret Cavendish is composed of 13 names. You can examine and separate out names.